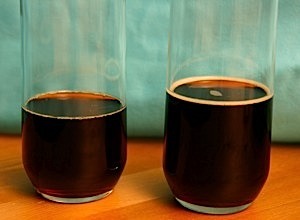 Though the Coca-Cola company claims that there is no difference in taste, many people claim to prefer Coke made with sugar. [...] Kosher for Passover Coke is also made with sugar, rather than corn syrup, due to the special dietary restrictions for observant Jews (Orthodox Jews are prohibited from consuming corn during this period) during the holiday. 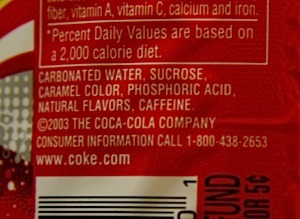 Here's a more detailed explanation of Passover Coke. Many die-hard Coke fans are convinced that its reformulation with HFCS damaged the taste, claiming that the sucrose version was less "sticky" or had a better aftertaste. To test this assertion, I purchased Passover Coke and did a blind test (good idea, Tiff, and thanks for conducting it) to determine which tasted better. I could tell there was a difference when I was looking for one. It's pretty obvious once you pin down exactly what the difference is. (But that's not easy.) But it's not such an extreme difference that I'd notice which one I was drinking if I was casually drinking one of them while doing something else. I preferred the Passover Coke, even before the identities were revealed. The Passover Coke was less sweet when it first hit my tongue, and the sweetness faded more quickly. Regular (HFCS) Coke had a lingering too-sweet aftertaste, as if I hadn't brushed my teeth in a while. Passover Coke distinctly lacked this. That's about it. If I was a die-hard Coke fanatic (I'm not, and I rarely drink soda), it would certainly be worth trying to find some Passover Coke for curiosity's sake. But it's not worth driving to a different state or mail-ordering it.